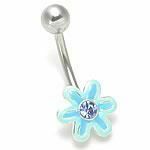 April showers, bring May flowers, this adorable flower navel ring is just the thing for spring. The outer petal enamel color is a light baby blue color, with a darker blue accent towards the middle. Adorned with a light sapphire gem in the center of the flower, it would be hard to not make this piece of jewelry a part of your belly ring collection.